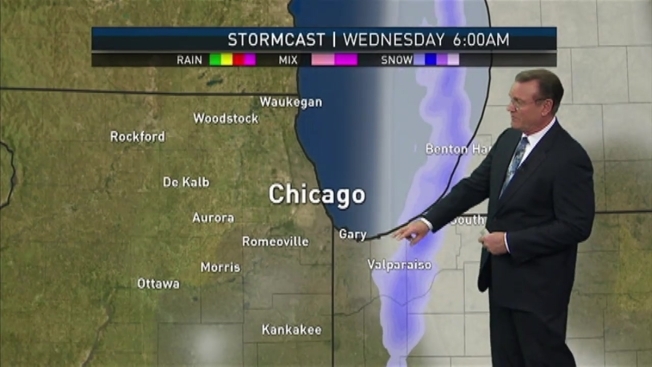 NBC 5 meteorologist Brant Miller has your latest forecast update. Snow continued to fall across the Chicago area Tuesday morning, dumping several inches in some suburbs, with even more possible. A Lake Effect Snow Warning was issued for Cook, DuPage and Lake counties from 7 p.m. Monday to 4 p.m. Tuesday, with the potential for heavy lake effect snow that could produce amounts higher than 6 inches in some areas. A second warning takes effect at 9 p.m. Tuesday in Porter County in northwest Indiana and remains in effect until 9 a.m. Wednesday.